UPDATE: Orders are now closed! We’re back to announce another very cool fan project! Yes, it’s a photobook but I don’t think we can ever tire of them right? keiel and xxLove812 will be producing the “What’s up, L.A.? 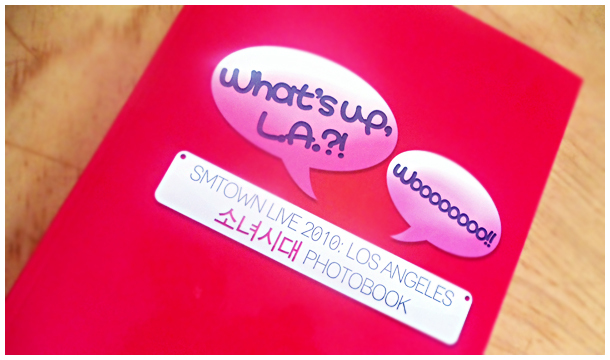 !” Photobook which will be a compilation of many amazing photos they took during the SMTown Live 2010 Concert in LA on September 4th 2010. Orders are open to U.S. and Canada residents only BUT if you live outside of these countries contact xxLove812 at dorkified812@yahoo.com. Shipping prices vary depending on whether you reside in the U.S. or Canada. No discounts apply to the price of the book if you order multiple copies. Though I’m sure if you get a couple of friends to order with, shipping price would decrease if split between each person. For convenience, the shipping prices are below. They have been taken directly from the project website. Estimated shipping time of the books is around the second week of November 2010. Payment method is Paypal and any fees will have to be covered by you. For instructions on how to place your order and further details go to the project site! Here’s a preview of the photobook. but my only teensy weensy ‘problem’ i had was that the pics were not quite as HQ as the watermarked versions available on SSF. i think this is probably more due to the printer than anything– but the colors are SO VIVID. plus, there are really no biases– a nice balance of solo, pairings, and group shots. There an ebay listing here. Meanwhile, could you get in touch personally with the book’s author (xxLove812) to see if she’s inclined to proceed with a reprint? If she gives you the green light, we’ll be happy to arrange the rest for you.